family frolics: Getting Along 24x7…Yeah Right! For the past several years my professional career has necessitated a lot of long hours, and too much travel – unfortunately at the expense of time with my family. 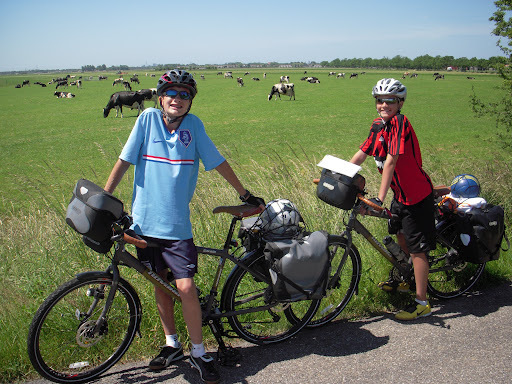 That was a big motivator to take this ‘trip of a lifetime’ - cycling as a family from Amsterdam to Paris. I had expected the first two responses, but the third response---I hadn’t considered. I didn’t think it would be a challenge. Think again. We are a family of go-getters. All of us set goals, work and play hard, live life with passion and have strong opinions. Back home in Seattle we had busy lives balancing work/school with extracurricular sports and activities. As a result we thirsted for time together as a family, and enjoyed dinners, games, sports (soccer/cycling/skiing) or a weekend escape to Orcas Island. We really like each other and have fun simply being together. Fast forward 1 month into our ‘trip of a lifetime’ and we’ve now been together for 750+ hours straight. If you consider that on a regular weekday in Seattle we might have just 4 hours together---you can imagine that the transition of being together 24/7 can be a little overwhelming. Consider this mix: I am a Type A former CEO, my wife holds an MBA and Culinary Degree and has equally strong opinions (think Courtney Cox on Friends), and our kids are budding adolescent boys who need our feedback less and less (12 and 13 years old). (2) Janelle deserves an award for living out of 2 panniers, keeping everyone happy without a refrigerator, and “keeping the peace” among her 3 boys (myself included) who are prone to share differences of opinion. Janelle is “low-maintenance” – thankfully – otherwise this trip would not be possible. She has come to realize that her boys get ‘crabby’ when they are hungry, so keeping a stash of stroop waffles (referred to as Scooby Snacks) around is a good idea (we refer to this stomach-filling as ‘taming the tiger.’). Notwithstanding family dynamics, Janelle’s biggest challenge has been containing her desire to write everyday given the lack of time and connectivity (despite James’ exhaustive efforts to provide her with Internet access---not even throwing money at Internet Service Providers in Holland seems to work---but more on that topic later). Amazingly, Janelle has continued to maintain www.talkoftomatoes.com and start www.familyfrolics.com while traveling abroad on bicycles. (4) Caleb is a competitor at heart and passionate voetball player (that is Dutch for soccer). Caleb has managed to befuddle his parents in multiple card games, and has recently ‘crossed the line’ by inventing a new game called “Snickelfritz” (thank you Isabel) – a combination of sorts of Chicago Rummy, Speed and Nerts. While Caleb is ready to play cards at every meal, he’s come to realize that his parents can actually win a game or two (even if we need reminders of the rules every game). Caleb’s seemingly boundless enthusiasm to play soccer, including juggling, kicking, passing on every walk, every street and in every piazza, is welcome fun, but can test the patience of his brother and parents when ‘culture’ has been our intended focus (for an hour or two?). Caleb tolerates his family’s pleas for downtime by redirecting his efforts to his sketchbook – a fantastic outlet for his creative energies. Yes, there have been a few bumps along the path as we’ve invaded each other’s lives and space. 24x7 is definitely an adjustment – even on a ‘trip of lifetime.’ However, we’ve managed to settle into a good groove and find opportunities to support one another. Above all, communication has been key. In fact, we probably over-communicate: we’re never short on opinions on what to do next, or how to solve a problem. But we are learning to listen better and compromise more. The biggest challenge for me, as a father, is letting go and watching our boys transition into young men who are ready to conquer the world. (Cheesy, I know, but true). But, I take solace in the fact that as they become map-reading masters on this trip, they will be better equipped to navigate their lives going forward. But YOU win a prize for first post to make me cry! What a great lesson to learn. As a single parent, I am having an even tougher time with this kind of transition. I guess all the togetherness is kind of forcing that realization. Kelucas: awwwww! I hope the tears followed laughter;) and at which point, the Courntey Cox comment? T Maher: YES the togetherness means we cannot escape each other OR ourselves. Wish us luck!